The one where the dog messes up my “After” photos. There is no need to hit the garden center to change up your flower pots. Just give them a quick coat of paint! I have two flower pots that have layer upon layer of spray paint on them. I dump the plants, paint the pots a new color for the new season, then replant them. I always start out painting the items upside down. That way you can hit the hard to reach places first. When you flip it right side up, it can dry in peace. 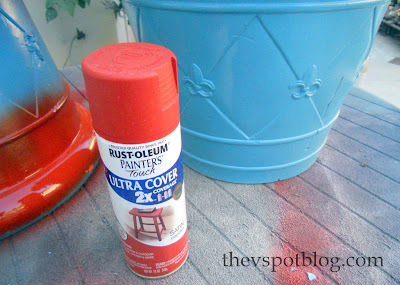 I used Rustoleum’s Painter’s Touch in Paprika. Precision and a perfectly prepped surface are not an issue for me on this project. Clearly. Let the pot dry and replant with seasonal flowers. I am darn lucky to have gotten this simple picture of this pot. My canine photographer’s assistant. My nosy neighbor. She knew she was getting in the way too, which is why she’s smiling like that. You can see her guilty dog video here. It’s OK… I’ll have killed the Mums within two weeks, but good dogs are hard to come by. I love that last picture of you two. Love the new look and of course I love Corsa! That picture of the two of you is priceless, nothing beats the love of a good dog! Around here, dog hair is our main accessory. No matter how much we sweep, “swiffer”, vacuum, dust, etc., there are clumps of hair EVERYWHERE. But….it doesn’t bother me. Like you, the love of our faithful companion is worth all the cleaning. He’s the best dog in the world! Awww….she’s giving you kisses!! Love her smile! I need to teach Lexi to do that. I like the color and the name–Paprika! I use that a lot when I’m cooking. I think it’s because I just love the name. So, you’re catching a flight out tomorrow for Florida, right? They sure have personalities don’t they. She was like,” This is all about ME, right? and look mom, I can smile real purdy… and wanna see my come hither stare?” They love to be right under our feet. My cats like to slink under whatever I am trying to paint and sport the color of the day on their tales. Love the dog pictures, cat hair gets all over everything I try to do! Love the pot painted red and the attitude about the dog hair. Who would see it anyway? Those dog snaps are priceless! Love that last statement about the mums dying in two weeks. True for me too. And that dog smile made me smile. 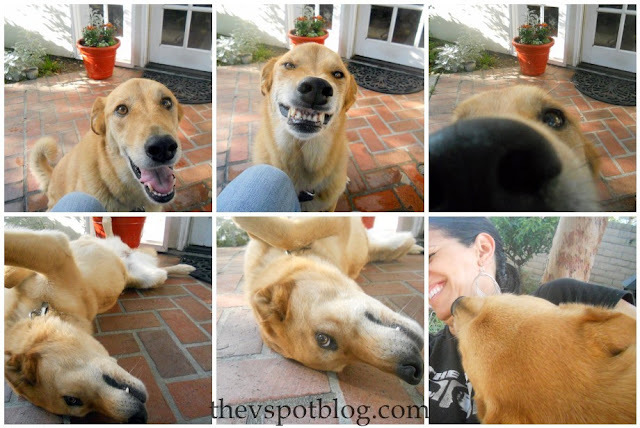 Love your doggie pictures too – that smiling one is fabulous. Love it! I always try to remember your tip about painting upside down then flipping it. I always forget of course, darn it! I WILL remember next time….hopefully. Love that last pic of you and your dog. Beautiful! Good tip! Can I paint plastic pots? The pot looks great, dog hair and all. But the goofy dog is priceless. Love the paprika color. But the dog pictures….greatness! Awww what a great pic of you and the pup! I heart the paprika color, great for fall! Your doggie is hilarious!!! I love that cheesy smile!! lol!!!!! HA HA – I do the same thing with my pots! I was thinking I might have to get new ones this year but maybe I’ll give them another chance. that’s my favorite spray paint too!